Multímetro digital de mesa de alta precisión con valor real (TRMS) con pantalla LCD dual de 4 5/6 dígitos con escala completa de 62999. Software de PC incluido para control y adquisición, función de registro de datos con memoria interna, memoria SD externa o disco USB. Interfaz con PC Bluetooth o USB, interfaz de red LAN. 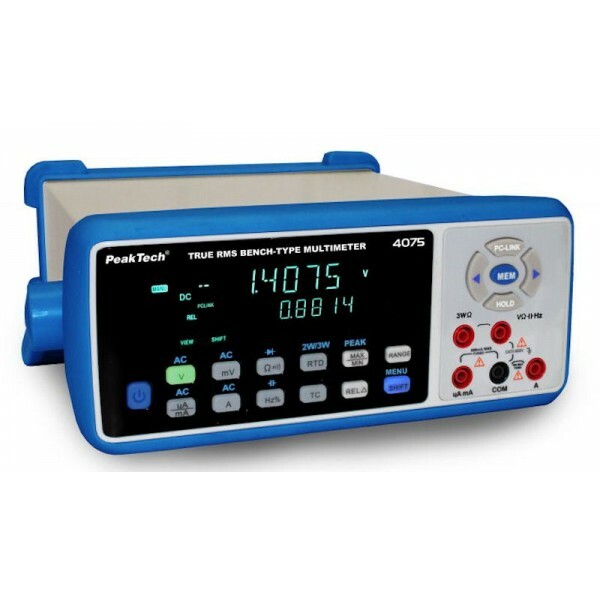 High precision digital bench type multimeter according to the latest technical standards, equipped with a dual 4 5/6 digits display (max. 63000). Its many features are completed by the true RMS measurement, the temperature and resistance measurement. The PC control and data acquisition software, integrated data logger function with internal memory, USB Disc or external SD memory card, wireless BluetoothTM connection to your PC, integration into the corporate network via LAN network connection, as well as the data connection via USB provides a wide variety of applications.